A winner never quits & a quitter never wins! To stay in shape and I enjoy the camaraderie with others. 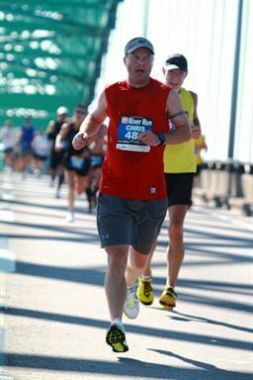 Qualifying for the Boston Marathon at the Melbourne Music & Beaches Marathon. A lot of my training partners were there to run the ½ marathon and stuck around to root me on to the finish line. Best race ever. I want to help others reach their goals as others have helped me. Pay it Forward. I was able to help 2 women from our run club reach the goal of qualifying for the Boston marathon. I will try my best to keep even mile splits and encourage you to relax and enjoy your marathon experience. We are going to have fun. Have fun with it. Stay positive-the mind is a very powerful tool. I have a 26.2 tattoo on my left calf.